Short-lasting unilateral neuralgiform headache attacks with conjunctival injection and tearing (SUNCT), which was first reported in 1978 and later described more fully,, is characterized by short-lasting unilateral headache attacks accompanied by ipsilateral lacrimation and conjunctival injection. In recognition of the possibility that all patients with generically the same condition might not have both conjunctival injection and tearing, the International Headache Society (IHS) Classification Committee suggested in 2004 that SUNCT syndrome may be a subset of a broader entity called SUNHA with autonomic symptoms (SUNA). In SUNA, only one cranial autonomic feature is sufficient to fulfill the diagnostic criteria. The subsequent revision of the International Classification of Headache Disorders (ICHD-3 beta) in 2013, introduced the diagnostic category SUNHA with SUNCT and SUNA being considered subtypes of SUNHA. Both SUNCT and SUNA are rare headache syndromes, but the prevalence and incidence are uncertain. A study from Australia reported an estimated prevalence and annual incidence of 6.6 and 1.2/100,000, respectively. In contrast, an epidemiologic study from Norway found two patients in a population of 1838, corresponding to the prevalence of 109 per 100,000. The typical age of onset is between 35 and 65, as seen in approximately two-thirds of primary SUNCT cases, but ranges from 5 to 88 years.,, A systematic review found that the mean age of onset for SUNHA was approximately 48 years. SUNHA has a male predominance. In a literature review published in 2013, with 222 cases (189 SUNCT, 31 SUNA, and 2 with both SUNCT and SUNA), the male-to-female ratio was 1.5:1. SUNCT and SUNA are characterized by sudden brief attacks of severe unilateral head pain in orbital, periorbital, or temporal regions, accompanied by ipsilateral cranial autonomic symptoms. In SUNCT, the ipsilateral autonomic symptoms must consist of both conjunctival injection and lacrimation. In SUNA, the autonomic symptoms may include either conjunctival injection or lacrimation, but not both. Otherwise, the presence of cranial autonomic symptoms for SUNCT and SUNA is similar and may include nasal congestion, rhinorrhea, miosis, ptosis, eyelid edema, forehead and facial sweating and/or flushing, and a sensation of fullness in the ear. The pain in SUNCT and SUNA is unilateral and typically located in orbital, supraorbital, or temporal regions., A minority of patients with SUNCT and SUNA have pain in other cranial areas, including the top, side or back of head, the nose, trigeminal V2 and V3 regions, the teeth, the neck, and/or the ear. In a series of 43 patients with SUNCT and 9 with SUNA, attacks could be categorized into one or more of three forms: single stabs of pain with a mean duration of 58 s (range 1–600 s); groups of stabs of pain with a mean attack duration of 396 s (range 10–1200); and “saw-tooth” attacks of continuous pain with multiple superimposed stabs and a mean attack duration of 1160 s (range 5–12,000). Some patients had more than one of these different types of attacks, and there was wide inter-patient variation in the length of attacks and number of attacks per day. 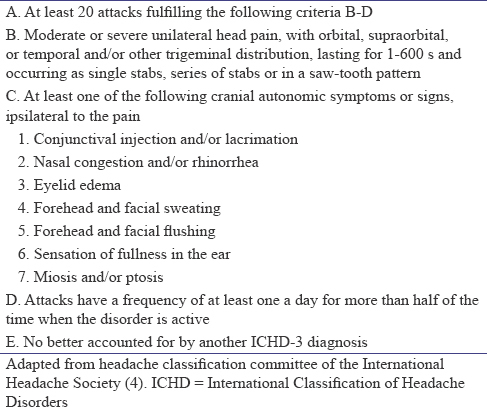 The ICHD-3 beta criteria [Table 1] for SUNHA specifies an attack length of 1–600 s, with an attack frequency of at least once a day for more than half the time when the disorder is active. SUNCT and SUNA are subclassified as episodic, with attacks occurring in periods lasting from 7 days to 1 year, separated by pain-free periods lasting at least 1 month; or chronic, with attacks occurring for more than 1 year without remission, or with remission periods lasting < 1 month. In a larger series of 52 patients with long follow-up, a chronic form was noted in 27 of 43 patients (63%) with SUNCT and all 9 patients with SUNA. Patients can have a mixture of spontaneous and triggered attacks, but purely triggered attacks are rarely reported. A potential explanation is that some cases of purely triggered attacks may have been incorrectly diagnosed as trigeminal neuralgia (TN). Thus, it is useful to recognize that occasional patients with SUNCT syndrome may experience only triggered attacks. In one of the larger series of 43 patients with SUNCT, a mixture of spontaneous and triggered attacks, purely spontaneous attacks, and purely triggered attacks occurred in 84, 14, and 2%, respectively. A literature review, with data on trigger factors available for 176 patients, reported exclusively spontaneous attacks in 27%. Unlike TN, SUNHA generally do not have a refractory period.,, In a literature review, with pertinent data available for 93 patients with SUNHA, there was no refractory period in 90%. In our series of 43 patients with SUNCT, spontaneous or triggered attacks could occur immediately after cessation of the previous attack in 41 patients (95%). For SUNA, attacks without a refractory period were observed in eight of nine patients. Although not a classic symptom, background pain between attacks is sometimes present in patients with SUNHA. In one series, persistent background pain was present in 20 of 43 patients (47%) with SUNCT and 2 of 9 with SUNA. The neurologic examination is usually normal in patients with SUNHA, although ipsilateral trigeminal sensory findings are present in occasional patients. In our series, abnormal sensation to pinprick (mainly hyperesthesia) in trigeminal V1 or V2 distribution was present in 6 of 43 patients (14%) with SUNCT and 2 of 9 with SUNA. Others have reported allodynia or hyperesthesia in the face,, a sensory deficit of the trigeminal V1 region in a patient with post-traumatic SUNCT, and a persistent ipsilateral Horner's syndrome. The differential diagnosis for SUNHA includes other trigeminal autonomic cephalalgias (TACs) (i.e., cluster headache, paroxysmal hemicrania, and hemicrania continua); TN; primary stabbing headache; and secondary causes of SUNHA. In cases where attacks appear to be prolonged, the main alternative diagnostic considerations are paroxysmal hemicrania and cluster headache. In cases of constant interictal pain, the main alternative diagnostic consideration is hemicrania continua. The clinical features of these TACs are outlined in [Table 2]. Differentiating SUNHA from TN can be challenging in some cases, as there is a considerable overlap in the clinical phenotypes of the two syndromes. Both headaches are short-lasting, can have a high frequency of attacks and display clustering of attacks. Both are principally unilateral headaches and the trigger zones behave similarly. The usual onset is during middle or old age in both. However, there are a number of differences between these two syndromes [Table 3], awareness of which can aid in their differentiation. Primary stabbing headache refers to brief, sharp, or jabbing pain in the head that occur either as a single episode or in brief repeated volleys. The pain is usually over the ophthalmic trigeminal distribution, whereas the face is generally spared. The pain usually lasts a fraction of a second but can persist for up to 1 min, thereby overlapping with the phenotype of SUNCT, and recurs at irregular intervals (hours to days). These headaches are generally easily distinguishable clinically as they differ in several respects in primary stabbing headache, there is a female preponderance; the site and radiation of pain often varies between attacks; the attacks occur spontaneously; cranial autonomic features are absent; and the attacks commonly subside with the administration of indomethacin. SUNHA is usually a primary headache disorder. However, there are several cases that are potentially secondary to intracranial lesions, typically located either in the posterior fossa or in the pituitary gland, as described below. In addition, there are case reports of SUNHA following viral meningitis or meningoencephalitis , and traumatic head injury., There is also a report of SUNCT secondary to an infraorbital metastatic bronchial carcinoid. Reports of SUNCT or SUNA associated with a posterior fossa abnormality include the following cases ipsilateral cerebellopontine arteriovenous malformation,, brainstem cavernous hemangioma, posterior fossa lesion associated with HIV/AIDS, severe basilar impression causing pontomedullary compression in a patient with osteogenesis imperfecta, craniosynostosis resulting in a foreshortened posterior fossa, brainstem infarction,, pilocytic astrocytoma expanding to the trigeminal root entry zone, parietal and parieto-occipital space-occupying lesions, pathologic white matter lesions associated with multiple sclerosis, and vertebral artery dissection. These posterior fossa abnormalities emphasize the absolute need for a cranial magnetic resonance imaging (MRI) in any suspected case of SUNHA. SUNCT has been described in patients both with microadenomas and macroadenomas, with attacks occurring on the side ipsilateral to the side of the tumor.,, In most cases, the pituitary adenomas associated with SUNCT have been prolactin or growth hormone-secreting tumors. Headache symptoms can precede pituitary symptoms by 3–10 years. Emerging evidence supports the frequent occurrence of vascular compression of the trigeminal nerve close to the root entry zone ipsilaterally to the side of the pain in SUNHA. In a series of 24 SUNHA cases, 17 patients were studied with dedicated MRI imaging of the trigeminal nerves. Neurovascular compression was detected in 15 of 17 patients (88%). In 90% of cases, a vascular loop was impinging the symptomatic trigeminal nerve, compared to only 7% in which the vascular loop was pressing on the asymptomatic nerve, suggesting that this finding was more than a mere chance association. An earlier series had reported that only 7% patients had trigeminovascular loops, but patients were not investigated systematically with dedicated trigeminal scans in that series. Should trigeminal neurovascular conflict be confirmed in a larger sample of patients, it would support an etiological overlap between SUNCT, SUNA, and TN; TN is known to be caused by a neurovascular conflict with the trigeminal nerve in 52%–88% of patients. These findings raise the possibility that peripheral mechanisms play a key role in the pathophysiology of SUNCT. In addition, some patients with SUNHA may benefit from trigeminal microvascular decompression (MVD), thereby underlining the importance of dedicated trigeminal nerve imaging. As SUNHA can be secondary to underlying structural pathology, including pituitary tumours, posterior fossa lesions, and trigeminal neurovascular conflict, it is recommended that the brain MRI with pituitary and trigeminal views as well as blood tests for pituitary function should be a minimal workup for SUNHA, even if there are no unexplained neurologic abnormalities on examination. In terms of therapeutic trials, SUNHA may be differentiated from paroxysmal hemicrania and hemicrania continua by the lack of response to indomethacin. An indomethacin challenge should, therefore, be considered in patients with prolonged SUNHA attacks and those who have interictal pain. Any pathophysiological construct for SUNHA should account for its major clinical characteristics. It has been proposed that some of the clinical features of SUNHA, namely, the occurrence of pronounced cranial autonomic symptoms with the pain, involves a central disinhibition of the trigemino-autonomic reflex, similar to the other TACs. The cerebral structure implicated in the disinhibition mechanism is thought to be the posterior hypothalamus, known to have a modulatory role in the nociceptive and autonomic pathways, specifically the trigeminovascular nociceptive pathways. Functional neuroimaging studies have showed activation of the posterior hypothalamus during SUNCT/SUNA attacks,, supporting its paramount role in these disorders. However, many clinical features of SUNHA, namely, duration, frequency, and character of the pain, along with the presence of cutaneous triggers overlap with TN. These similarities along with the high proportion of patients demonstrating trigeminal neurovascular conflict ipsilaterally to the side of the pain support the notion that more peripheral mechanisms may be involved in the complex pathophysiological mechanisms of this disorder. This implies that SUNCT and SUNA may also share pathogenic mechanisms with TN, namely, a demyelination of the trigeminal sensory root due to vascular compression. This abnormality would be responsible for the short-lived painful paroxysms, and it would also be responsible for the ephaptic cross-talk between fibers that drive sensation and nociceptive fibers, explaining the triggerability of the attacks in some SUNCT and SUNA patients. SUNCT, SUNA, and TN may be attributable to a unifying pathophysiological model characterized by different degrees of interaction between peripheral and central mechanisms, namely, focal demyelination of the trigeminal sensory root and posterior hypothalamic dysfunction. Central mechanisms may be more pronounced in patients with at least two cranial autonomic symptoms and less pronounced in patients with one or no autonomic symptoms. Since the attacks are very short-lasting, attack therapy strategies are not useful in SUNHA. There is no available abortive treatment for the individual attacks. Before the use of lamotrigine, SUNHA was considered to be highly refractory to medical treatments. Lamotrigine may be the most effective preventive treatment and is considered the drug of choice for the preventive treatment of SUNHA. In a case series of 29 patients, treatment with lamotrigine (up to 600 mg daily) was associated with moderate to good response in 18 patients (62%), including 17 of 25 patients with SUNCT and 1 of 4 patients with SUNA. Topiramate may be useful as a preventive medication for SUNHA. In a case series of 22 patients, treatment with topiramate (up to 400 mg daily) was associated with a good response in 11 (50%). Gabapentin may useful as preventive therapy in SUNHA. In a series of 27 SUNHA patients, treatment with gabapentin (up to 3600 mg daily) was associated with a good response in 13 (48%). An open-label study of gabapentin (up to 900 mg daily) reported complete remission of SUNCT attacks in five of eight patients. 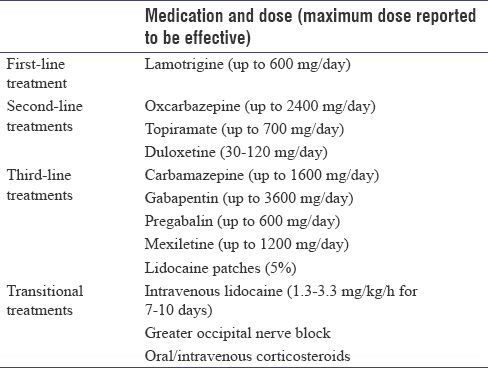 The therapeutic response to carbamazepine has been reported in 33 cases. In 22 of 33 patients (67%), there was no beneficial response with the sole use of carbamazepine. Among the 11 patients with a favourable response, eight of the 33 patients had a partial response, and three had a complete or almost complete response. In an open-label series of 36 SUNCT and five SUNA patients treated with carbamazepine, 40% of SUNCT and 20% of SUNA patients reported a favorable response. Several other medications, alone or in combination, have been employed to treat SUNHA, including oxcarbazepine, clomiphene, valproate, verapamil, lithium, zonisamide, and onabotulinum toxin A injections. Given the sparse data available on these drugs, it is difficult to comment on their efficacy. There can be a lag of several days to a few weeks before the efficacy of preventive treatments becomes apparent. Transitional treatments, which produce a rapid suppression of the attacks for a limited period, can be used when waiting for the beneficial effect of a preventive treatment to become evident. The administration of intravenous (IV) lidocaine was highly effective at completely suppressing the headaches in four patients with SUNCT. Subsequently, 11 SUNCT and four SUNA patients reported a favorable outcome during the administration of IV lidocaine at the dose of 1.5–3.5 mg/kg/h. Given the quick and dramatic, but often short-lasting effect in most SUNHA patients, it is advisable to use IV lidocaine as a short-term treatment in patients who present with a severe exacerbation or “status” and also to avoid breakthrough attacks while switching from a preventive drug to another in patients with high load of attacks. Our protocol consists of using IV lidocaine ranging from 1.3 to 3.3 mg/kg/h for 7–10 days. Twenty-four hours electrocardiography monitoring is mandatory during the infusion. A suboccipital injection of a combination of lidocaine and a steroid was beneficial in five out of eight SUNCT patients. Greater occipital nerve injections (GONIs) may render the patient pain free for weeks or months, allowing the introduction and dose escalation of preventive medications. The results of the largest open-label study in the medical treatment of SUNCT and SUNA have been recently reported. The authors assessed the outcome of several preventive and transitional treatments prospectively administered in an open-label fashion in 62 SUNCT and 50 SUNA patients. No significant differences in treatment responses were noticed between SUNCT and SUNA; therefore, SUNCT and SUNA patients were considered together when results were reported. Lamotrigine was effective in 67% of patients treated (n = 59/88 patients), topiramate in 44.4% (n = 24/54 patients), gabapentin in 27.8% (n = 17/61 patients), and carbamazepine in 45.6% (n = 26/57 patients), the latter providing a partial response in most patients who reported a benefit. Oxcarbazepine was beneficial in 59% of patients (n = 20/34 patients), whereas the percentage of patients successfully treated with pregabalin was the same as those treated with gabapentin (28%; n = 12/43 patients); mexiletine was beneficial in 55.6% of patients (n = 5/9 patients) though the tolerability profile of this drug was poor. Remarkably, duloxetine was beneficial in 39% of patients (n = 5/13 patients). The majority of patients treated with lamotrigine, oxcarbazepine, topiramate, and duloxetine, reported a good-to-excellent benefit. Among transitional treatments, IV lidocaine rendered 87% of patients (n = 29/31 patients) pain-free, though the pain tended to recur rapidly when treatment was stopped for most of them. A GONI using a mixture of methylprednisolone 80 mg and lidocaine 2% 2 ml was effective in 35.7% (n = 20/56 patients), for a median of 14 days (range: 1–150 days). [Table 4] shows a proposed algorithm of medical treatment of SUNCT and SUNA, based on the open-label literature evidence. Several surgical approaches have been tried in SUNHA. The approaches attempted can be subdivided into three main groups: ablative procedures of the trigeminal nerve, MVD of the trigeminal nerve and neurostimulation techniques. Procedures that have been tried in SUNCT syndrome include percutaneous trigeminal ganglion compression, trigeminal ganglion thermocoagulation,, retrogasserian glycerol rhizolysis,, and gamma-knife surgery. Isolated case reports have suggested a potential effectiveness of these treatments. On the other hand, patients who had a poor outcome from these procedures have also been reported., Adverse events of these procedures include hypoesthesia, keratitis, and anesthesia dolorosa, which can be a highly disabling complication though very rare. In view of the sparsity of data on the efficacy of these procedures taken together with the complications, these procedures are best avoided for now. Williams and Broadley, who systematically looked for trigeminal neurovascular conflict with dedicated trigeminal MRI scans, found a high proportion of ipsilateral vascular loops in contact with the trigeminal nerve in SUNCT and SUNA (88%, n = 15/17). This supported the notion of MVD being a potential treatment for these conditions. To date, ten cases and a case series of nine patients with medically intractable SUNHA, who underwent MVD of the trigeminal nerve, have been reported.,,,,,, After a median follow-up of 14 months (range: 0.5–32 months), 12 of 19 (63%) of cases were pain-free, whereas in the remaining patients, the procedure had little or no effect. Two patients suffered from persistent complications, such as ataxia and hearing loss, whereas in five cases transient complications were noted. Although series with longer follow-up would be ideal to assess the long-term efficacy of MVD for refractory chronic SUNHA, this approach can nonetheless be considered in patients with ipsilateral trigeminovascular conflict, though possible benefit should be weighed against operation-related risks of permanent neurological deficits. Miller et al. recently presented the long-term outcome of 31 medically intractable SUNHA patients treated with occipital nerve stimulation (ONS). At a median follow-up of 45 months (range 13–89 months), there was a 69% improvement in attack frequency with a response rate (defined as at least a 50% improvement in daily attack frequency) of 77%. Attack severity reduced by 4.7 points on the verbal rating scale and attack duration by a mean of 64%. Battery failure or voluntary stimulator switch-off were followed by recurrence or worsening of the attacks within few days in most of the patients. Adverse event rates were favorable, with no electrode migration or erosion reported, and only one patient (3%) suffering a superficial wound infection requiring medical management only. In view of the functional imaging evidence of posterior hypothalamus region activation in TACs including SUNHA  and the previous reports on deep brain stimulation (DBS) of this region, now understood to be the ventral tegmental area, for medically refractory cluster headache, this treatment strategy has been tried in medically intractable chronic SUNHA. In an open-label prospective study, eleven patients underwent ipsilateral ventral tegmental area DBS. Median follow-up was 29 months (range 7–63). At final follow-up, the median improvement in daily attack frequency was 78%. Response rate (defined as at least a 50% improvement in daily attack frequency) was 82%, and four patients were rendered pain free for prolonged periods of time. Headache load (a composite score of attack frequency, severity, and duration) improved by 99%. Adverse events included mild-incision site pain, subcutaneous displacement of the implantable pulse generator, transient oscillopsia, and minor wound infection. One patient required removal of the system due to wound infection. MVD, ONS and DBS have all been found to be effective in open-label series with relatively high response rates. The invasiveness of surgery, associated risks, the need for implanted hardware and the cost of treatment will all influence individual patient options. With these in mind, we recommend that patients with medically-intractable SUNHA first undergo MVD if they have ipsilateral neurovascular compression of the trigeminal nerve, that ONS be reserved for those without neurovascular compression or failing MVD and DBS (as the most invasive neuromodulation option) be left as an option when patients have failed all other procedures. SUNCT, SUNA, and TN are considered different disorders and thus are grouped in separate sections of ICHD-3 beta. However, data on the clinical phenotype and effective management strategies in SUNCT and SUNA have shown striking similarities with TN. Moreover, studies exploring radiological findings support the hypothesis of common etiological and pathophysiological basis between SUNCT/SUNA and TN, with trigeminal neurovascular conflict in significant proportions of these patients. Hence, despite being considered distinct conditions, emerging clinical and radiological evidence support a broader nosological concept of SUNCT, SUNA, and TN. These conditions may constitute a continuum of the same disorder, rather than separate clinical entities. In view of this, consideration needs to be given to classifying SUNHA with TN as a cranial neuralgia rather than as a TAC. Sjaastad O, Russell D, Horven I, Bunaes U. Multiple Neuralgiform, Unilateral Headache Attacks Associated with Conjunctival Injection and Appearing in Clusters. A Nosological Problem. Proceedings of the Scandinavian Migraine Society; 1978. p. 31. Pareja JA, Sjaastad O. SUNCT syndrome. A clinical review. Headache 1997;37:195-202. Sjaastad O, Saunte C, Salvesen R, Fredriksen TA, Seim A, Røe OD, et al. Shortlasting unilateral neuralgiform headache attacks with conjunctival injection, tearing, sweating, and rhinorrhea. Cephalalgia 1989;9:147-56. Williams MH, Broadley SA. SUNCT and SUNA: Clinical features and medical treatment. J Clin Neurosci 2008;15:526-34. Matharu MS, Cohen AS, Boes CJ, Goadsby PJ. Short-lasting unilateral neuralgiform headache with conjunctival injection and tearing syndrome: A review. Curr Pain Headache Rep 2003;7:308-18. Sékhara T, Pelc K, Mewasingh LD, Boucquey D, Dan B. Pediatric SUNCT syndrome. Pediatr Neurol 2005;33:206-7. Vikelis M, Xifaras M, Mitsikostas DD. SUNCT syndrome in the elderly. Cephalalgia 2005;25:1091-2. Calvo JF, Bruera OC, de Lourdes Figuerola M, Gestro D, Tinetti N, Leston JA, et al. SUNCT syndrome: Clinical and 12-year follow-up case report. Cephalalgia 2004;24:900-2. Graff-Radford SB. SUNCT syndrome responsive to gabapentin (Neurontin). Cephalalgia 2000;20:515-7. Putzki N, Nirkko A, Diener HC. Trigeminal autonomic cephalalgias: A case of post-traumatic SUNCT syndrome? Cephalalgia 2005;25:395-7. Prakash KM, Lo YL. SUNCT syndrome in association with persistent horner syndrome in a chinese patient. Headache 2004;44:256-8. Ito Y, Yamamoto T, Ninomiya M, Mizoi Y, Itokawa K, Tamura N, et al. Secondary SUNCT syndrome caused by viral meningitis. J Neurol 2009;256:667-8. Eguia P, Garcia-Monco JC, Ruiz-Lavilla N, Diaz-Konrad V, Monton F. SUNCT and trigeminal neuralgia attributed to meningoencephalitis. J Headache Pain 2008;9:51-3. Jacob S, Saha A, Rajabally Y. Post-traumatic short-lasting unilateral headache with cranial autonomic symptoms (SUNA). Cephalalgia 2008;28:991-3. Black D, Swanson J, Eross E, Cutrer FM. Secondary SUNCT due to intraorbital, metastatic bronchial carcinoid. Cephalalgia 2005;25:633-5. Bussone G, Leone M, Dalla Volta G, Strada L, Gasparotti R, Di Monda V, et al. Short-lasting unilateral neuralgiform headache attacks with tearing and conjunctival injection: The first “symptomatic” case? Cephalalgia 1991;11:123-7. Morales F, Mostacero E, Marta J, Sanchez S. Vascular malformation of the cerebellopontine angle associated with “SUNCT” syndrome. Cephalalgia 1994;14:301-2. De Benedittis G. SUNCT syndrome associated with cavernous angioma of the brain stem. Cephalalgia 1996;16:503-6. Goadsby PJ, Lipton RB. A review of paroxysmal hemicranias, SUNCT syndrome and other short-lasting headaches with autonomic feature, including new cases. Brain 1997;120(Pt 1):193-209.
ter Berg JW, Goadsby PJ. Significance of atypical presentation of symptomatic SUNCT: A case report. J Neurol Neurosurg Psychiatry 2001;70:244-6. Morís G, Ribacoba R, Solar DN, Vidal JA. SUNCT syndrome and seborrheic dermatitis associated with craneosynostosis. Cephalalgia 2001;21:157-9. Penart A, Firth M, Bowen JR. Short-lasting unilateral neuralgiform headache with conjunctival injection and tearing (SUNCT) following presumed dorsolateral brainstem infarction. Cephalalgia 2001;21:236-9. Blättler T, Capone Mori A, Boltshauser E, Bassetti C. Symptomatic SUNCT in an eleven-year-old girl. Neurology 2003;60:2012-3. Vilisaar J, Constantinescu CS. SUNCT in multiple sclerosis. Cephalalgia 2006;26:891-3. Jacob S, Rajabally Y. Short-lasting unilateral neuralgiform headache with cranial autonomic symptoms (SUNA) following vertebral artery dissection. Cephalalgia 2007;27:283-5. Levy MJ, Matharu MS, Goadsby PJ. Prolactinomas, dopamine agonists and headache: Two case reports. Eur J Neurol 2003;10:169-73. Matharu MS, Levy MJ, Merry RT, Goadsby PJ. SUNCT syndrome secondary to prolactinoma. J Neurol Neurosurg Psychiatry 2003;74:1590-2. Levy MJ, Jäger HR, Powell M, Matharu MS, Meeran K, Goadsby PJ, et al. Pituitary volume and headache: Size is not everything. Arch Neurol 2004;61:721-5. Lambru G, Matharu MS. SUNCT, SUNA and trigeminal neuralgia: Different disorders or variants of the same disorder? Curr Opin Neurol 2014;27:325-31. Irimia P, González-Redondo R, Domínguez PD, Díez-Valle R, Martínez-Vila E. Microvascular decompression may be effective for refractory SUNCT regardless of symptom duration. Cephalalgia 2010;30:626-30. Bartsch T, Levy MJ, Knight YE, Goadsby PJ. Differential modulation of nociceptive dural input to [hypocretin] orexin A and B receptor activation in the posterior hypothalamic area. Pain 2004;109:367-78. Cohen AS. Short-lasting unilateral neuralgiform headache attacks with conjunctival injection and tearing. Cephalalgia 2007;27:824-32. Etemadifar M, Maghzi AH, Ghasemi M, Chitsaz A, Kaji Esfahani M. Efficacy of gabapentin in the treatment of SUNCT syndrome. Cephalalgia 2008;28:1339-42. Matharu MS, Cohen AS, Goadsby PJ. SUNCT syndrome responsive to intravenous lidocaine. Cephalalgia 2004;24:985-92.
de Lourdes Figuerola M, Bruera O, Pozzo MJ, Leston J. SUNCT syndrome responding absolutely to steroids in two cases with different etiologies. J Headache Pain 2009;10:55-7. Trauninger A, Alkonyi B, Kovács N, Komoly S, Pfund Z. Methylprednisolone therapy for short-term prevention of SUNCT syndrome. Cephalalgia 2010;30:735-9. Lambru G, Matharu MS. SUNCT and SUNA: Medical and surgical treatments. Neurol Sci 2013;34 Suppl 1:S75-81. Morales-Asín F, Espada F, López-Obarrio LA, Navas I, Escalza I, Iñiguez C, et al. A SUNCT case with response to surgical treatment. Cephalalgia 2000;20:67-8. Black DF, Dodick DW. Two cases of medically and surgically intractable SUNCT: A reason for caution and an argument for a central mechanism. Cephalalgia 2002;22:201-4. Piovesan EJ, Siow C, Kowacs PA, Werneck LC. Influence of lamotrigine over the SUNCT syndrome: One patient follow-up for two years. Arq Neuropsiquiatr 2003;61:691-4. Hannerz J, Linderoth B. Neurosurgical treatment of short-lasting, unilateral, neuralgiform hemicrania with conjunctival injection and tearing. Br J Neurosurg 2002;16:55-8. Effendi K, Jarjoura S, Mathieu D. SUNCT syndrome successfully treated by gamma knife radiosurgery: Case report. Cephalalgia 2011;31:870-3. Gardella L, Viruega A, Rojas H, Nagel J. A case of a patient with SUNCT syndrome treated with jannetta procedure. Cephalalgia 2001;21:996-9. Lagares A, Gómez PA, Pérez-Nuñez A, Lobato RD, Ramos A. Short-lasting unilateral neuralgiform headache with conjunctival injection and tearing syndrome treated with microvascular decompression of the trigeminal nerve: Case report. Neurosurgery 2005;56:E413. Guerreiro R, Casimiro M, Lopes D, Marques JP, Fontoura P. Video neuroImage: Symptomatic SUNCT syndrome cured after trigeminal neurovascular contact surgical decompression. Neurology 2009;72:e37. Williams M, Bazina R, Tan L, Rice H, Broadley SA. Microvascular decompression of the trigeminal nerve in the treatment of SUNCT and SUNA. J Neurol Neurosurg Psychiatry 2010;81:992-6. Miller S, Watkins L, Matharu M. Long-term follow up of intractable chronic short lasting unilateral neuralgiform headache disorders treated with occipital nerve stimulation. Cephalalgia 2017. [Epub ahead of print].